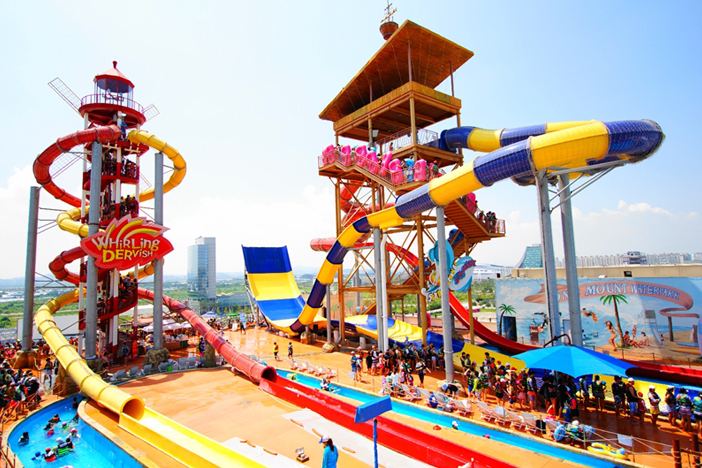 Keep Cool in Summer at Korea’s Popular Water Parks! One of the first things people think of when summer comes to mind is fun with water, whether it is at a river, a lake, or a beach. It's not easy, however, to fully enjoy those activities within an urban area. This article will introduce Korea's top water parks designed to let you get your fill of water fun without having to leave town, including other options great for overnight trips. 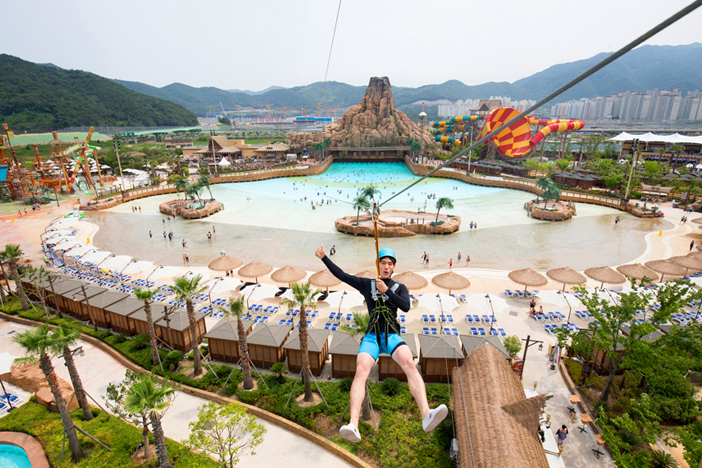 Caribbean Bay, a water park located just outside of Seoul in the city of Yongin, holds the titles of both the first and the largest water park in the country. Caribbean Bay can accommodate up to 20,000 people, and has five themed zones that include indoor pools, outdoor pools, spas, water rides, water slides, and many other amusement facilities. The most popular attractions at the water park are the exciting wave pool, with waves reaching up to 2.4 meters high, and the Mega Storm, a 355m-long exhilarating water slide that offers an adrenaline rush that you can't get anywhere else. Visitors looking for even more thrills can try out the Aqua Loop, rushing down 90km to end at a 18 meter drop! Onemount Water Park in Gyeonggi-do’s Ilsan is a four-story structure with a seven-story rooftop that lets visitors look down on the various slides and attractions in the park, as well as the nearby Ilsan Lake Park. Most of the attractions for children are on the fourth floor, and rides for adults are located on the seventh floor. One of the most popular rides is Sky Boomerango, a ride that starts from atop a 50m-tall tower. Riders get in a two-person tube to shoot down before being launched into the air off a ramp to fall into a water pool at the end. In addition, the next-door attraction Cola Ride is another must for thrill-seekers, which will give you an unforgettable memory of free falling thanks to its near-vertical 10m-high slide. Located in Mullae-dong, Yeongdeungpo-gu, Seoul, Sealala Spa & Water Park is a place where Seoulites can enjoy water fun any time of the year. 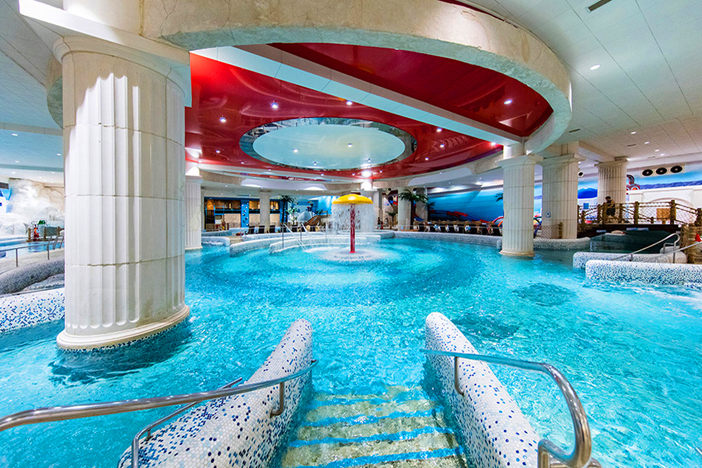 Although it is not as big as other water parks in Korea, it boasts an exotic Greece-themed décor and offers easy access via subway. The place is famous for its 140m-long lazy river, beach pool where visitors can splash around, 20m-long speedy water slide, and 32m-long mat slide. It's also a perfect spot for family with children, as Aqua Kidsland within the water park offers kids-friendly attractions such as kids water slides, piano fountain, and more. ☞ Directions: Mullae Station (Seoul Subway Line 2), Exit 5. Walk for approx. 10 min. ※ Sauna and jjimjilbang are open 24 hours and require a separate fee. ※ Fees may vary depending by time and season. Check the official website for details. Historically frequented by the kings of the Joseon Dynasty, the hot springs of Icheon are well known for their excellent water quality. Located in this famed hot springs city, Termeden is a hot spring resort complex that is popular for its high-quality water and luxurious facilities. Although the park has various pools, spas, and slides, one of the most famous attractions at Termeden is the bade pool. The themed hot spring pools are highly recommended, with natural ingredients such as ginseng, rice, and honey added in each spa to provide various unique health benefits. 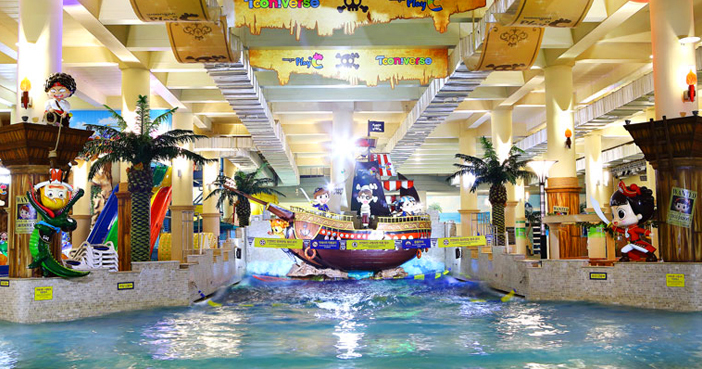 Woongjin Playdoci, a very unique indoor theme park, is located in the metropolitan city of Bucheon, Gyeonggi-do. 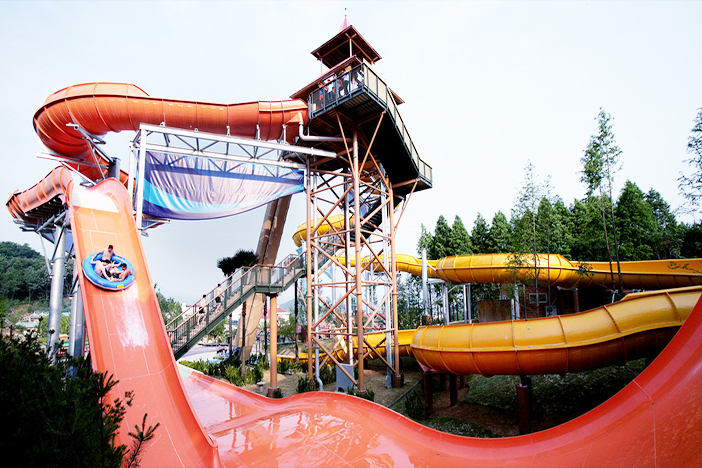 In addition to having basic pool facilities, Woongjin Playdoci Waterdoci, which is the central area of the venue, includes Kids Zone and diverse entertaining water slides. The Spa Zone offers bade pools with a variety of water jet massage options that help ease fatigue and provide health benefits to the skin. Adults and kids alike are bound to get their fill of fun with the seasonal event pools and outdoor Sunny Park during the summer. Overnight trip to regional water parks! 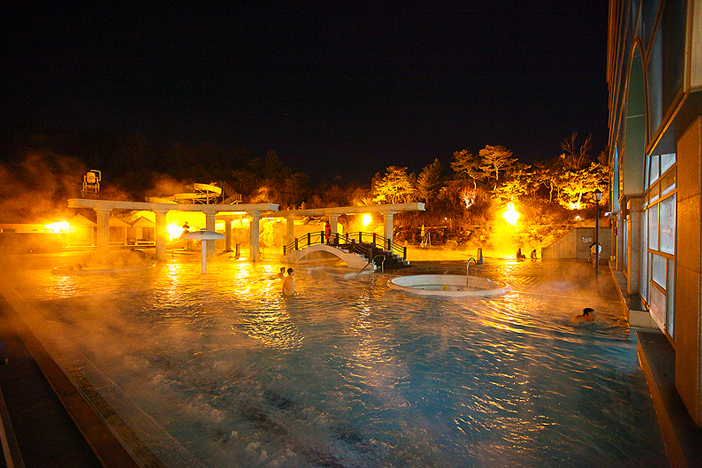 Resom Spa Castle (Chunchunhyang) represents one of Korea's best hot spring theme parks, thanks to the widespread fame of its therapeutic Germanium-rich water, which is maintained at 49°C. 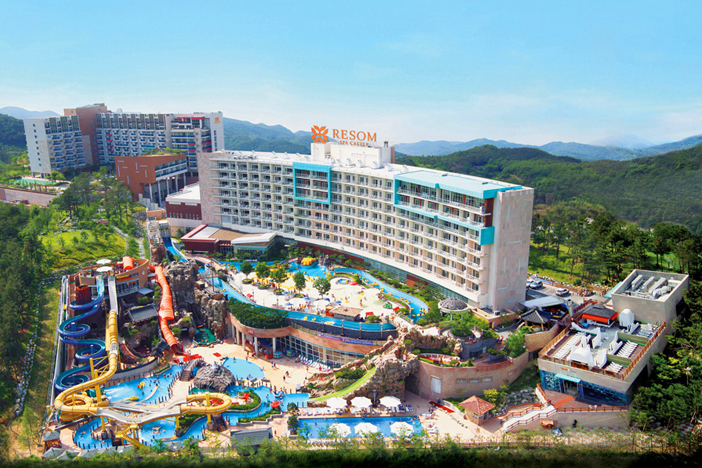 Located in Yesan-gun, Chungcheongnam-do, Resom Spa Castle's hot spring facility Chunchunhyang is open all year round. Looking for a thrill? Try the water park's famous water slides: the exhilarating Master Blaster and the Speed Slide, a thriller-ride that propels you down a three-story water chute in just four seconds. For some fun that's slightly less intense, check the outdoors to enjoy over 20 hot spring water park facilities and open-air pools. Seorak Waterpia is the most popular destination on the East Coast. With the stunning scenery of Seoraksan Mountain serving as a backdrop, this place offers the latest in water amusement facilities and hot spring water spas. If you are looking for fun and thrills, check out the water slides and wave pools. 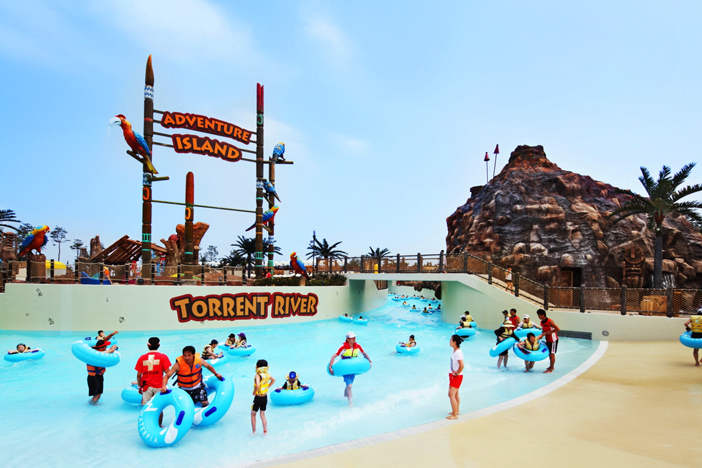 Popular rides in this action-packed park include World Alley, a 260m-long water slide with a sharp drop and a 360-degree turn, Torrent River, and Family Raft. Vivaldi Park Ocean World is situated among the beautiful ancient forests of Hongcheon in Gangwon-do. The water park has an Egyptian theme throughout, and contains replicas of the Sphinx, pyramids, obelisks, and other decorative touches. The park is divided into Indoor Zone, Wave Pool Zone, Extreme Zone, Dynamic Zone, and the Mega Slide Zone with each section offering amusement of its own. The Indoor Zone has various pools and slides, a jjimjilbang, and a therapy center. In the Extreme Zone, people can experience exciting thrills with waves as high as 2.4m. Opened in May 2014, Gimhae Lotte Water Park in Gyeongsangnam-do features custom-designed, Polynesian-themed water slides and pools. 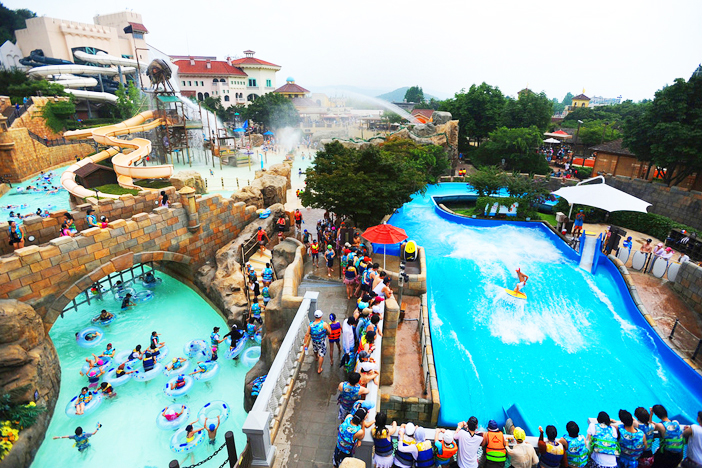 The water park boasts some of Korea’s largest pool facilities, including the 135m-long outdoor wave pool, 35m-long indoor wave pool, and a huge 118m-long Tornado Slide, among other attractions. * This column was last updated in June 2018, and therefore information may differ from what is presented here. We advise you to check details before visiting.